Sen-oku Hakuko Kan, also known as the Sumitomo Collection, exhibits and preserves art objects collected by the Sumitomo family. The museum is located in Kyoto’s Shishigatani, close to the eastern end of the famed Philosopher’s Path. The exhibition space dedicatedly displays exceptional ancient Chinese bronzes. Walking through the scenic garden brings visitors to the special exhibition annex. What the room lacks in character is made up for by the quality of the displayed artwork. 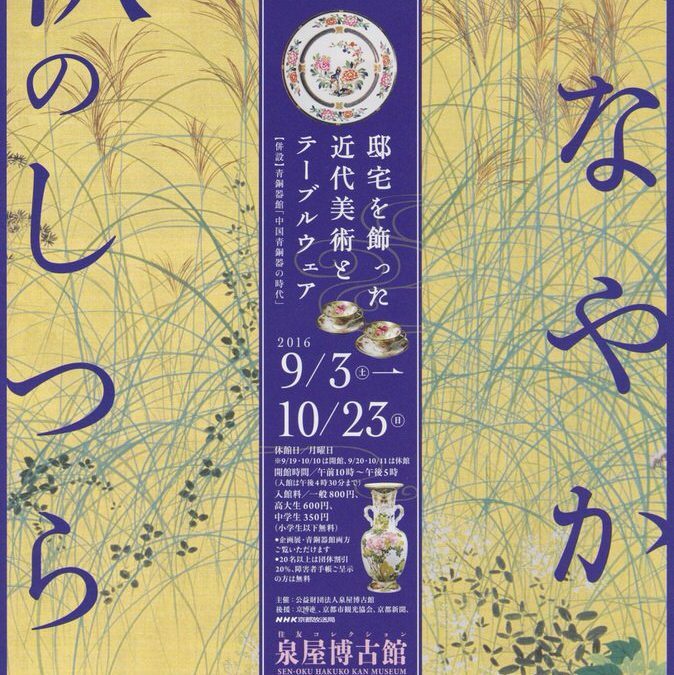 From September 3 to October 23, 2016, an exhibition titled Equipment in Autumn – Japanese Modern Arts and Crafts is being held with many important artworks on display. Of particular note, and featured on the front of the exhibition flyer, are a pair of gorgeous folding screens by Konoshima Okoku (1877-1938). Painted in 1923, the screens feature flowering plants of autumn, hibiscus, morning glories, bluebells and pampas grass on a ground of glittering golden silk. Almost overwhelming in its beauty, it epitomizes the wealth and luxury of the time. The walls are largely dedicated to the display of early 20th century Yoga, or Western-style paintings. Two important artists are well represented: Umehara Ryuzaburo (1888-1986) and Kishida Ryusei (1891-1926). Showcasing his abilities as a colorist, Ryuzaburo’s works date to the mid-20th century. His painting of roses in a cobalt vase readily brings Matisse’s works to mind. Ryusei is best known for his many portraits of his beloved daughter, Reiko, which are possibly Japan’s most celebrated portraiture. Pictured with her slightly askew features and an unsettling atmosphere, Ryusei’s portraits have captivated viewers since their creation. Two paintings of Reiko are on display. The exhibition is predominantly centered on Chinese inspired works by Japanese ceramic giants of the late 19th and early 20th centuries. Exceptional works by artists such as Miyagawa Kozan, Seifu Yohei and Ito Tozan line the display cases. Notable are a cloisonné vase with a peacock feather design by Ando Jubei and a large bronze vase wrapped in ivy leaves by Isozaki Yoshitsugu. A collection of Chinese snuff bottles and Western tableware complete the set of items on display.